You should at least give yourself some chance of recovering it, but even better, disable it, post a reward message on it's screen, make it emit loud annoying alarm sounds, have it report it's current location, and send you a picture of the person who has it (assuming your device has a camera). This will take less than ten minutes to set this up. Once installed it does not slow down your device or even show up on the device. In fact. it does NOTHING until after it is lost and you report the loss by marking it as missing. The people at PreyProject.com did a great job with this app. Did you lose the receipt for your laptop? Fail to record the serial number? Forget the model number? The web site will get all that from the device, everything you need to file a police report. Once you mark your device as missing, and the person who has it turns it on, it will even take a screen capture and a photo every 10 minutes so you can see what they were doing and who did it. Three steps to securing your stuff. On your home computer, go to preyproject.com and set up an account. Make a paper note of the email account and password. Use the same email and password on the devices when you set then up in the next step. 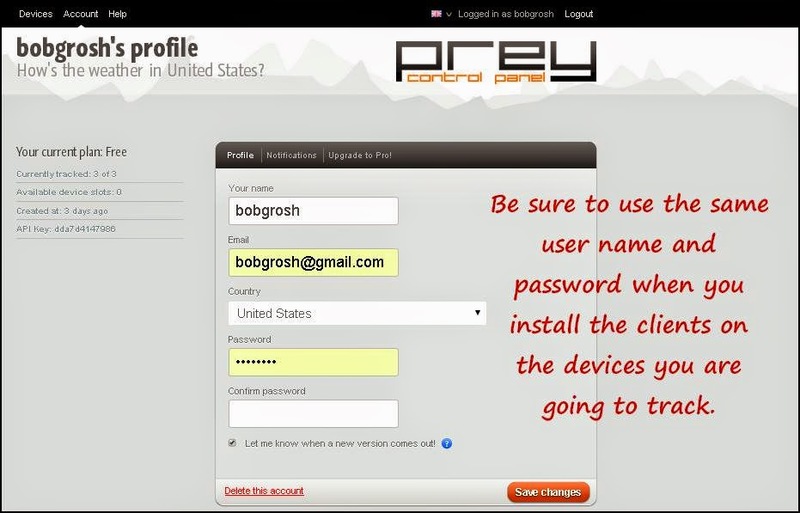 Go to the Prey Download page and follow the instructions to install the client on each of your portable devices. You are done setting up your devices. NOTE. On your protected devices Prey is completely hidden. You can't change it or unistall it without going to the Prey website and loging in. If someone steals your laptop they won't easily find Prey or uninstall it.Each time you turn the device on, prey checks the Prey website to see if it is missing. If it is not, it just goes back to sleep. Prey remains hidden and only activates when you go to the Prey Website and mark the device as missing. If one of your devices is lost log into the Prey website, go to the Device tab and click on the device that is missing. Shown here on the left is where you set the device missing. You can also lock the device, set an alarm or display a reward message. You should really play with this a little to get familiar with how it works and make sure you did the client installs correctly. Now for the Cool Technology Stuff! So, how does it locate your laptop? Laptops, and some tablets don't have a GPS. So how does that work? You may remember a report I did about privacy a few weeks back. It seems that someone "discovered" that Google was recording more than pictures with those Google earth cars. They were also recording WiFi signals. The uniformed masses were all in an uproar about Google "spying" on our WiFi home networks, possibly reading our email. (Never mind that those home networks were sending data, such as emails, out on the net, making it entirely unnecessary for Google to send a car out to your house.) What Google was really doing is recording the id's and relative signal strengths of all the WiFi signals. At any given point in the average neighborhood, as many as a dozen WiFi routers can be detected, your device normally only connects to one of them. By recording the signal strength every few feet while the Google Maps car drives through the neighborhood, the relative locations of all the WiFi routers can be mapped out. When someone turns on your missing device, it turns on the WiFi receiver and checks all the reachable WiFi signals and measures their strength. It does this even before it connects to one of them. When your device is marked as missing, the Prey app on your device simply sends the names and relative strength of all those signals to the Prey Project web site and they are checked against the Google map data. By triangulation and a little math, your missing device can be located to within a few feet is some areas. That's even more accurate than GPS.